Jam, pie, tea, and preserves: most people have noshed on some form of this summer fruit before. But did you know the blackberry, botanically speaking, is not actually a berry? It is technically an “aggregate fruit,” which means it forms from one flower, but is made up of multiple smaller fruits called drupes. While blackberries are most often cooked as part of a dessert, they can also be used to make wine. Bees like the nectar of the flowers, and they make great honey. 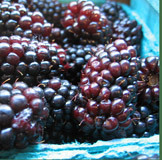 Blackberries are also nutritional powerhouses that rank high among antioxidant-rich fruits. Although their seeds can get stuck in your teeth, try not to spit them out. They contain omega-3 and omega-6 fatty acids.